After the end of the war with Germany in May 1945, a program was initiated to bring to the United States a number of scientists and engineers who had been at the center of Germany's advanced military technologies. The largest and best-known activity was called Operation Paperclip. In August 1945, 127 missile specialists led by Wernher von Braun signed work contracts with the U.S. Army's Ordnance Corps. Most of them had worked on the V-2 missile development under von Braun at Peenemünde. Von Braun and the other Germans were sent to Fort Bliss, Texas, joining the Army's newly formed Research and Development Division Sub-office (Rocket). For the next five years, von Braun and the German scientists and engineers were primarily engaged in adapting and improving the V-2 missile for U.S. applications; testing was conducted at nearby White Sands Proving Grounds, New Mexico. Von Braun had long had a great interest in rocketry for space science and exploration. Toward this, he was allowed to use a WAC Corporal rocket as a second stage for a V-2; the combination, called Bumper, reached a record-breaking 250 miles (400 km) altitude. During World War II, the production and storage of ordnance shells was conducted by three arsenals nearby to Huntsville, Alabama. After the war, these were closed, and the three areas were combined to form Redstone Arsenal. In October 1948, the Chief of Ordnance designated Redstone Arsenal as the center of research and development activities in free-flight rockets and related items, and the following June, the Ordnance Rocket Center was opened. A year later, the Secretary of the Army approved the transfer of the rocket research and development activities from Fort Bliss to the new center at Redstone Arsenal. Beginning in April 1950, about 1,000 persons were involved in the transfer, including von Braun's group. At this time, R&D responsibility for guided missiles was added, and studies began on a medium-range guided missile that eventually became the Redstone rocket. Over the next decade, the missile development on Redstone Arsenal greatly expanded. Many small free-flight and guided rockets were developed, and work on the Redstone rocket got underway. Although this rocket was primarily intended for military purposes, von Braun kept space firmly in his mind, and published a widely read article on this subject. In mid-1952, the Germans who had initially worked under individual contracts were converted to civil service employees, and in 1954-55, most became U.S. citizens. Von Braun was appointed Chief of the Guided Missile Development Division. In September 1954, von Braun proposed using the Redstone as the main booster of a multi-stage rocket for launching artificial satellites. A year later, a study for Project Orbiter was completed, detailing plans and schedules for a series of scientific satellites. The Army's official role in the U.S. space satellite program was delayed, however, after higher authorities elected to use the Vanguard rocket then being developed by the Naval Research Laboratory (NRL). In February 1956, the Army Ballistic Missile Agency (ABMA) was established; von Braun was the director of the Development Operations Division. One of the primary programs was a 1,500-mile (2,400 km), single-stage missile that was started the previous year; intended for both the U.S. Army and U.S. Navy, this was designated the PGM-19 Jupiter. Guidance component testing for this Jupiter intermediate range ballistic missile (IRBM) began in March 1956 on a modified Redstone missile dubbed Jupiter A while re-entry vehicle testing began in September 1956 on a Redstone with spin-stabilized upper stages named Jupiter-C. The first Jupiter IRBM flight took place from Cape Canaveral in March 1957 with the first successful flight to full range on 31 May. Jupiter was eventually taken over by the U.S. Air Force. The ABMA developed Jupiter-C was composed of a Redstone rocket first stage and two upper stages for RV tests or three upper stages for Explorer satellite launches. ABMA had originally planned the 20 September 1956 flight as a satellite launch but, by direct intervention of Eisenhower, was limited to the use of 2 upper stages for an RV test flight traveling 3,350 miles (5,390 km) and attaining an altitude of 682 miles (1,098 km). While the Jupiter C capability was such that it could have placed the fourth stage in orbit, that mission had been assigned to the NRL. Later Jupiter-C flights would be used to launch satellites. The Soviet Union launched Sputnik 1, the first man-made earth satellite, on October 4, 1957. This was followed on November 3 with the second satellite, Sputnik 2. The United States attempted a satellite launch on December 6, using the NRL's Vanguard rocket, but it barely struggled off the ground, then fell back and exploded. On January 31, 1958, after finally receiving permission to proceed, von Braun and the ABMA space development team used a Jupiter C in a Juno I configuration (addition of a fourth stage) to successfully place Explorer 1, the first American satellite, into orbit around the earth. Effective at the end of March 1958, the U.S. Army Ordnance Missile Command (AOMC), was established at Redstone Arsenal. This encompassed the ABMA and its newly operational space programs. In August, AOMC and Advanced Research Projects Agency (ARPA, a Department of Defense organization) jointly initiated a program managed by ABMA to develop a large space booster of approximately 1.5-million-pounds thrust using a cluster of available rocket engines. In early 1959, this vehicle was designated Saturn. On April 2, President Dwight D. Eisenhower recommended to Congress that a civilian agency be established to direct nonmilitary space activities, and on July 29, the President signed the National Aeronautics and Space Act, creating the National Aeronautics and Space Administration (NASA). The nucleus for forming NASA was the National Advisory Committee for Aeronautics (NACA), with its 7,500 employees and Ames Research Center (ARC), Langley Research Center (LaRC), and Lewis Flight Propulsion Laboratory (later LRC, then Glenn RC) becoming the initial operations of NASA. Despite the existence of an official space agency, the Army continued with certain far-reaching space programs. In June 1959, a secret study on Project Horizon was completed by ABMA, detailing plans for using the Saturn booster in establishing a manned Army outpost on the Moon. Project Horizon, however, was rejected, and the Saturn program was transferred to NASA. The U.S. manned satellite space program, using the Redstone as a booster, was officially named Project Mercury on November 26, 1958. With a future goal of manned flight, monkeys Able and Baker were the first living creatures recovered from outer space on May 28, 1959. They had been carried in the nose cone on a Jupiter missile to an altitude of 300 miles (480 km) and a distance of 1,500 miles (2,400 km), successfully withstanding 38 times the normal pull of gravity. Their survival during speeds over 10,000 miles per hour was America's first biological step toward putting a man into space. On October 21, 1959, President Eisenhower approved the transfer of all Army space-related activities to NASA. 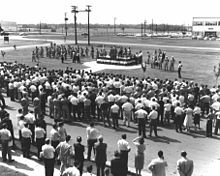 This was accomplished effective July 1, 1960, when 4,670 civilian employees, about $100 million worth of buildings and equipment, and 1,840 acres (7.4 km2) of land transferred from AOMC/ABMA to NASA's George C. Marshall Space Flight Center. 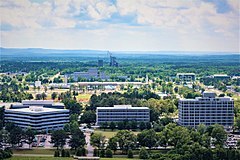 MSFC officially opened at Redstone Arsenal on this same date, then was dedicated on September 8 by President Eisenhower in person. The Center was named in honor of General of the Army George C. Marshall, Army Chief of Staff during World War II, United States Secretary of State, and Nobel Prize winner for his world-renowned Marshall Plan. From its initiation, MSFC has been NASA's lead center for the development of rocket propulsion systems and technologies. During the 1960s, the activities were largely devoted to the Apollo Program – man's first visit to the Moon. In this, the Saturn Family of launch vehicles were designed and tested at MSFC. Following the highly successful Moon landing, including initial scientific exploration, MSFC had a major role in Post-Apollo activities; this included Skylab, the United States' first space station. With a permanent space station as an objective, the Space Shuttle was developed as a reusable transportation vehicle, and with it came Spacelab and other experimental activities making use of the Shuttle’ cargo bay. These and other projects are described in a later section. But first, MSFC's present capabilities and projects are addressed. Marshall Space Flight Center has capabilities and projects supporting NASA's mission in three key areas: lifting from Earth (Space Vehicles), living and working in space (International Space Station), and understanding our world and beyond (Advanced Scientific Research). MSFC is NASA's designated developer and integrator of launch systems. The state-of-the-art Propulsion Research Laboratory serves as a leading national resource for advanced space propulsion research. Marshall has the engineering capabilities to take space vehicles from initial concept to sustained service. For manufacturing, the world's largest-known welding machine of its type was installed at MSFC in 2008; it is capable of building major, defect-free components for manned-rated space vehicles. In early March 2011, NASA Headquarters announced that MSFC will lead the efforts on a new heavy-lift rocket that, like the Saturn V of the lunar exploration program of the late 1960s, will carry large, man-rated payloads beyond low-Earth orbit. The Center will have the program office for what is being called the Space Launch System (SLS). Before it was cancelled in early 2010 due to budget issues, the Constellation Program had been a major activity in NASA since 2004. In this program, MSFC was responsible for propulsion on the heavy-lift vehicles. These vehicles were designated Ares I and Ares V, and would replace the aging Space Shuttle fleet as well as transport humans to the Moon, Mars, and other deep-space destinations. Starting in 2006, the MSFC Exploration Launch Projects Office began work on the Ares projects. On October 28, 2009, an Ares I-X test rocket lifted off from the newly modified Launch Complex 39B at Kennedy Space Center (KSC) for a two-minute powered flight; then continued for four additional minutes traveling 150 miles (240 km) down range. MSFC had responsibility for the Space Shuttle's propulsion engines. On February 1, 2003, the Space Shuttle Columbia disaster occurred, with the orbiter disintegrating during reentry and resulting in the death of its seven crew members. Flights of the other Shuttles were put on hold for 29 months. Based on a seven-month investigation, including a ground search that recovered debris from about 38 percent of the Orbiter, together with telemetry data and launch films, indicated that the failure was caused by a piece of insulation that broke off the external tank during launch and damaged the thermal protection on the Orbiter's left wing. MSFC was responsible for the external tank, but few or no changes to the tank were made; rather, NASA decided that it was inevitable that some insulation might be lost during launch and thus required that an inspection of the orbiter's critical elements be made prior to reentry on future flights. NASA retired the Space Shuttle in 2011, leaving America dependent upon the Russian Soyuz spacecraft for manned space missions. The initial plans for the Space Station envisaged a small, low-cost Crew Return Vehicle (CRV) that would provide emergency evacuation capability. The 1986 Challenger disaster led planners to consider a more capable spacecraft. The Orbital Space Plane (OSP) development got underway in 2001, with an early version expected to enter service by 2010. With the initiation of the Constellation program in 2004, the knowledge gained on the OSP was transferred to Johnson Space Center (JSC) for use in the development of the Crew Exploration Vehicle. No operational OSP was ever built. The International Space Station is a partnership of the United States, Russian, European, Japanese, and Canadian Space Agencies. The station has continuously had human occupants since November 2, 2000. Orbiting 16 times daily at an average altitude of about 250 mi (400 km), it passes over some 90 percent of the world's surface. It has a mass over 932,000 pounds (423,000 kg), and a crew of six conducts research and prepares the way for future explorations. NASA began the plan to build a space station in 1984. The station was named Freedom in 1988, and changed to the International Space Station (ISS) in 1992. The ISS is composed in modules, and the assembly in orbit started with the delivery of Russian module Zarya in November 1998. This was followed in December by the first U.S. module, Unity also called Node 1, built by Boeing in facilities at MSFC. As the 21st century started, Space Shuttle flights carried up supplies and additional small equipment, including a portion of the solar power array. The two-module embryonic ISS remained unmanned until the next module, Destiny, the U.S. Laboratory, arrived on February 7, 2001; this module was also built by Boeing at MSFC. The three-module station allowed a minimum crew of two astronauts or cosmonauts to be on the ISS permanently. In July, Quest air-lock was added to Unity, providing the capability for extra-vehicular activity (EVA). Since 1998, 18 major U.S. components on the ISS have been assembled in space. In October 2007, Harmony or Node 2, was attached to Destiny; also managed by MSFC, this gave connection hubs for European and Japanese modules as well as additional living space, allowing the ISS crew to increase to six. The 18th and final major U.S. and Boeing-built element, the Starboard 6 Truss Segment, was delivered to the ISS in February 2009. With this, the full set of solar arrays could be activated, increasing the power available for science projects to 30 kW. That marked the completion of the U.S. "core" of the station. On 5 March 2010, Boeing turned over to NASA the U.S. on-orbit segment of the ISS. It is planned that the International Space Station will be operated at least through the end of 2030. With the retirement of the Space Shuttle fleet in 2011, future manned missions to the ISS will depend upon the Russian Soyuz spacecraft for the immediate future, until being succeeded by the Commercial Crew Development program. MSFC is involved in some of the most advanced space research of our time. Scientist/Astronaut researchers aboard the International Space Station are engaged in hundreds of advanced experiments, most of which could not be conducted except for the zero-gravity environment. The deep-space images from the Hubble Space Telescope and the Chandra X-ray Observatory are made possible in part by the people and facilities at Marshall. The Center was not only responsible for the design, development, and construction of these telescopes, but it is also now home to the only facility in the world for testing large telescope mirrors in a space-simulated environment. Preliminary work has started on a Hubble successor, the James Webb Space Telescope (JWST); this will be the largest primary mirror ever assembled in space. In the future, the facility will likely be used for another successor, the Advanced Technology Large-Aperture Space Telescope (AT-LAST). The National Space Science and Technology Center (NSSTC) is a joint research venture between NASA and the seven research universities of the State of Alabama. The primary purpose of NSSTC is to foster collaboration in research between government, academia, and industry. It consists of seven research centers: Advanced Optics, Biotechnology, Global Hydeology & Climate, Information Technology, Material Science, Propulsion, and Space Science. Each center is managed by either MSFC, the host NASA facility, or the University of Alabama in Huntsville, the host university. The Hubble Space Telescope was launched in April 1990, but gave flawed images. It had been designed at MSFC, but used a primary mirror that had spherical aberration due to incorrect grinding and polishing by the contractor. The defect was found when the telescope was in orbit. The design was such that repairs were possible, and three maintenance missions were flown in Shuttles during the 1990s. Another servicing mission (STS-109) was flown on March 1, 2002. Each mission resulted in considerable improvements, with the images receiving worldwide attention from astronomers as well as the public. Based on the success of earlier maintenance missions, NASA decided to have a fifth service mission to Hubble; this was STS-125 flown on May 11, 2009. The maintenance and addition of equipment resulted in Hubble performance considerably better than planned at its origin. It is now expected that the Hubble will remain operational until its successor, the James Webb Space Telescope (JWST), is available in 2018. The Chandra X-ray Observatory, originating at MSFC, was launched on July 3, 1999, and is operated by the Smithsonian Astrophysical Observatory. With an angular resolution of 0.5 arcsecond (2.4 µrad), it has a thousand times better resolution than the first orbiting X-ray telescopes. Its highly eliptical orbit allows continuous observations up to 85 percent of its 65-hour orbital period. With its ability to make X-ray images of star clusters, supernova remnants, galactic eruptions, and collisions between clusters of galaxies - in its first decade of operation it has transformed astronomer's view of the high-energy universe. The Fermi Gamma-ray Space Telescope, initially called the Gamma-Ray Large Area Space Telescope (GLAST), is an international, multi-agency space observatory used to study the cosmos. It was launched June 11, 2008, has a design life of 5 years and a goal of 10 years. The primary instrument is the Large Area Telescope (LAT) that is sensitive in the photon energy range of 8 to greater than 300 GeV. It can view about 20% of the sky at any given moment. The LAT is complemented by the GLAST Burst Monitor (GBM) which can detect burst of X-rays and gamma rays in the 8-keV to 3-MeV energy range, overlapping with the LAT. The GBM is a collaborative effort between the U.S. National Space Science and Technology Center and the Max Planck Institute for Extraterrestrial Physics in Germany. MSFC manages the GBM, and Charles A. Meegan of MSFC is the Principal Investigator. Many new discoveries have been made in the initial period of operation. For example, on May 10, 2009, a burst was detected that, by its propagation characteristics, is believed to negate some approaches to a new theory of gravity. The Burst and Transient Source Experiment (BATSE), with Gerald J. Fishman of MSFC serving as Principal Investigator, is an ongoing examination of the many years of data from gamma-ray bursts, pulsars, and other transient gamma-ray phenomena. The 2011 Shaw Prize, often called "Asia's Nobel Prize," was shared by Fishman and Italian astronomer Enrico Costa for their gamma-ray research. For 10 years, MSFC has supported activities in the U.S. Laboratory (Destiny) and elsewhere on the International Space Station through the Payload Operations Center (POC). The research activities include experiments on topics ranging from human physiology to physical science. Operating around the clock, scientists, engineers, and flight controllers in the POC link Earth-bound researchers throughout the world with their experiments and astronauts aboard the ISS. As of March 2011[update], this has included the coordination of more than 1,100 experiments conducted by 41 space-station crew members involved in over 6,000 hours of science research. Teams at Marshall manage NASA's programs for exploring the Sun, the Moon, the planets, and other bodies throughout our solar system. These have included Gravity Probe B, an experiment to test two predictions of Einstein's general theory of relativity, and Solar-B, an international mission to study the solar magnetic field and origins of the solar wind, a phenomenon that affects radio transmission on the Earth. The MSFC Lunar Precursor and Robotic Program Office manages projects and directs studies on lunar robotic activities across NASA. MSFC also develops systems for monitoring the Earth's climate and weather patterns. At the Global Hydrology and Climate Center (GHCC), researchers combine data from Earth systems with satellite data to monitor biodiversity conservation and climate change, providing information that improves agriculture, urban planning, and water-resource management. On November 19, 2010, MSFC entered the new field of microsatellites with the successful launch of FASTSAT (Fast, Affordable, Science and Technology Satellite). Part of a joint DoD/NASA payload, it was launched by a Minotaur IV rocket from the Kodiak Launch Complex on Kodiak Island, Alaska. FASTSAT is a platform carrying multiple small payloads to low-Earth orbit, creating opportunities to conduct low-cost scientific and technology research on an autonomous satellite in space. FASTSAT, weighing just under 400 pounds (180 kg), serves as a full scientific laboratory containing all the resources needed to carry out scientific and technology research operations. It was developed at the MSFC in partnership with the Von Braun Center for Science & Innovation and Dynetics, Inc., both of Huntsville, Alabama. Mark Boudreaux is the project manager for MSFC. There are six experiments on the FASTSAT bus, including NanoSail-D2, which is itself a nanosatellite – the first satellite launched from another satellite. It was deployed satisfactorily on January 21, 2011. In addition to supporting NASA's key missions, the spinoffs from these activities at MSFC have contributed broadly to technologies that improve the Nation and the World. In the last decade alone, Marshall generated more than 60 technologies featured as NASA spinoffs. MSFC research has benefited firefighters, farmers, plumbers, healthcare providers, soldiers, teachers, pilots, divers, welders, architects, photographers, city planners, disaster relief workers, criminal investigators, and even video-gamers and golfers. The Space Shuttle is likely the most complex spacecraft ever built. Although MSFC was not responsible for developing the centerpiece – the Orbiter Vehicle (OV) – it was responsible for all of the rocket propulsion elements: the OV's three main engines, the External Tank (ET), and the Solid-Rocket Boosters (SRBs). MSFC was also responsible for Spacelab, the research facility carried in the Shuttle's cargo bay on certain flights. From the start of the program in 1972, the management and development of Space Shuttle propulsion was a major activity at MSFC. Alex A. McCool, Jr. was manager of MSFC's Space Shuttle Projects Office. On April 12, 1981, Columbia made the first orbital test flight of a full Space Shuttle with two astronauts. This was designated STS-1 (Space Transportation System-1), and verified the combined performance of the entire system. This was followed by STS-2 on November 12, also using Columbia, primarily to demonstrate safe re-launch of a Shuttle. During 1982, two more test flights (STS-3 & STS-4) were made. STS-5, launched November 11, was the first operational mission; carrying four astronauts, two commercial satellite were deployed. In all three of these flights, on-board experiments were carried and conducted on pallets in the Shuttle's cargo bay. Space Shuttle Challenger was launched on mission STS-51-L on January 28, 1986. (The sequential numbering changed after 1983, but otherwise this would have been STS-25). One-minute, 13-seconds into flight, the entire Challenger was enveloped in a fireball and broke into several large segments, killing the seven astronauts. Subsequent analysis of the high-speed tracking films and telemetry signals indicated that a leak occurred in a joint on one of the solid rocket boosters (SRBs), the escaping flame impinged on the surface of the external tank (ET); there followed a complex series of very rapid structural failures, and in milliseconds the hydrogen and oxygen streaming from the ruptured tank exploded. The basic cause of the disaster was determined to be an O-ring failure in the right SRB; cold weather was a contributing factor. The redesign effort, directed by MSFC, involved an extensive test program to verify that the SRBs were safe. There were no Space Shuttle missions in the remainder of 1986 or in 1987. Flights resumed in September 1988, with sequential numbering starting with STS-26. As a reusable space-launch vehicle, the space shuttles carried a wide variety of payloads – from scientific research equipment to highly classified military satellites. The flights were assigned a Space Transportation System (STS) number, in general sequenced by the planned launch date. The Wikipedia list of space shuttle missions shows all flights, their missions, and other information. The first orbital flight (STS-1) by Shuttle Columbia on April 12, 1981, did not have a payload, but all flights that followed generally had multiple payloads. Through 1989, there were 32 flights; this includes the one on January 28, 1986, when Challenger was lost, and the delay until September 29, 1988, when flights resumed. During the 1990s, there were 58 flights, giving a total of 95 successful flights through 1999. For the Magellan planetary spacecraft, MSFC managed the adaptation of the Inertial Upper Stage. This solid-rocket was used in May 1989 to propel the spacecraft from Orbiter Atlantis on a 15-month loop around the Sun and eventually into orbit around Venus for four years of radar surface-mapping. Many Shuttle flights carried equipment for performing on-board research. Such equipment was accommodated in two forms: on pallets or other arrangements in the Shuttle's cargo bay (most often in addition to hardware for the primary mission), or within a reusable laboratory called Skylab. All such experimental payloads were under the general responsibility of MSFC. Pallet experiments covered a very wide spread of types and complexity, but many of them were in fluid physics, materials science, biotechnology, combustion science, and commercial space processing. For some missions, an aluminum bridge fitting across the cargo bay was used. This could carry 12 standard canisters holding isolated experiments, particularly those under the Getaway Special (GAS) program. GAS flights were made available at low cost to colleges and universities, American industries, individuals, foreign governments, and others. Astronomy Laboratory-1 (ASTRO-1) was developed by Goddard Space Flight Center and flown on STS-35 in December 1990. The $150-million payload included an X-ray telescope and three ultraviolet (UV) telescopes. The displays to be used by the on-board scientist-astronaut to aim the UV telescopes failed. An astronomer in the MSFC Payload Control Center then did the telescope pointing. Atmospheric Laboratory for Applications and Science (ATLAS 1) was carried on STS-45 launched in March 1992. This had l2 instruments from the U.S., France, Germany, Belgium, Switzerland, The Netherlands, and Japan. Experiments were conducted in atmospheric chemistry, solar radiation, space plasma physics, and ultraviolet astronomy. In addition to the pallet experiments, many other experiments were flown and performed using Spacelab. This was a reusable laboratory consisting of multiple components, including a pressurized module, an unpressurized carrier, and other related hardware. Under a program managed by MSFC, ten Europeans nations jointly designed, built, and financed the first Spacelab through the European Space Research Organisation (ESRO. In addition, Japan funded a Spacelab for STS-47, a dedicated mission. U.S. Microgravity Laboratory 1 (USML-1) was launched in June 1992 on STS-50, the first Extended Duration Orbiter. During 14 days, 31 microgravity experiments were completed in round-the-clock operations. USML-2 was launched in October 1995 on STS-73 with an MSFC scientist, Frederick W. Leslie, as an on-board Payload Specialist. In early 1990, MSFC's new Spacelab Mission Operations Control Center took over the responsibility for controlling all Spacelab missions. This replaced the Payload Operations Control Center formerly situated at the JSC from which previous Spacelab missions were operated. The advent of the Space Shuttle made possible several major space programs in which MSFC had significant responsibilities. These were the International Space Station, the Hubble Space Telescope, the Chandra X-Ray Observatory, and the Compton Gamma-Ray Observatory. The latter three are part of NASA's series of Great Observatories; this series also includes the Spitzer Space Telescope, but this was not launched by a Space Shuttle and MSFC had no significant role in its development. A manned space station had long been in the plans of visionaries. Wernhar von Braun, in his widely read Collier's Magazine 1953 article, envisioned this to be a huge wheel, rotating to produce gravity-like forces on the occupants. In Project Horizon, prepared by the U.S. Army in 1959, a space station would be built by assembling spent booster rockets. Following this same basic concept, in 1973 MSFC used a modified stage of Saturn V to put into orbit Skylab, but this was preceded by the Soviet Union's Salyut in 1971, then followed by their Mir in 1986. Even during Skylab, MSFC began plans for a much more complete space station. President Ronald Reagan announced plans to build Space Station Freedom in 1984. Luther B. Powell was MSFC's space station program manager. By the late 1990s, planning for four different stations were underway: the American Freedom, the Soviet/Russian Mir-2, the European Columbus, and the Japanese Kibō. In June 1992, with the Cold War over, American President George H. W. Bush and Russian President Boris Yeltsin agreed to cooperate on space exploration. Then in September 1993, American Vice-President Al Gore, Jr., and Russian Prime Minister Viktor Chernomyrdin announced plans for a new space station. In November, plans for Freedom, Mir-2, and the European and Japanese modules were incorporated into a single International Space Station. Boeing began as NASA's prime contractor for U.S. hardware in January 1995. The ISS is composed of a number of modules, sharing primary power from large arrays of solar power cells. The first module, Zarya from Russia, was delivered to orbit by a Proton rocket on November 20, 1998. On December 4, the first American component, Unity, a connecting module, was carried up by Space Shuttle Endeavour on flight STS-88; it was then joined with Zarya to form an embrionic ISS. Unity was built by Boeing in MSFC facilities. Additional building supplies were carried to the ISS in May 1999, aboard STS-96. The ISS continued to be assembled throughout the next decade, and has been continuously occupied since February 7, 2001. In March 2010, Boeing completed its contract and officially turned over to NASA the U.S. on-orbit segment of the ISS. Shortly after NASA was formed, the Orbiting Solar Observatory was launched, and was followed by the Orbiting Astronomical Observatory (OAO) that carried out ultraviolet observations of stars between 1968 and 1972. These showed the value of space-based astronomy, and led to the planning of the Large Space Telescope (LST) that would be launched and maintained from the forthcoming space shuttle. Budget limitations almost killed the LST, but the astronomy community – especially Lyman Spitzer – and the National Science Foundation pressed for a major program in this area. Congress finally funded LST in 1978, with an intended launch date of 1983. MSFC was given responsibility for the design, development, and construction of the telescope, while Goddard Space Flight Center (GFC) was to control the scientific instrument and the ground-control center. As the Project Scientist, MSFC brought on board C. Robert O’Dell, then chairman of the Astronomy Department at the University of Chicago. Several different people, at various times, served as the project manager. The telescope assembly was designed as a Cassegrain reflector with hyperbolic mirror polished to be diffraction limited; the primary mirror had a diameter of 2.4 m (94 in). The mirrors were developed by the optics firm, Perkin-Elmer. MSFC did not have a facility to check the ‘end-to-end’ performance of the mirror assembly, so the telescope could not be totally checked until launched and placed in service. The LST was named the Hubble Space Telescope in 1983, the original launch date. There were many problems, delays, and cost increases in the program, and the Challenger disaster delayed the availability of the launch vehicle. Finally, on April 24, 1990, on Mission STS-31, Shuttle Discovery launched the Hubble telescope successfully into its planned orbit. Almost immediately it was realized that the optical performance was not as expected; analysis of the flawed images showed that the primary mirror had been ground to the wrong shape, resulting in spherical aberration. Fortunately, the Hubble telescope had been designed to allow in-space maintenance, and in December 1993, mission STS-61 carried astronauts to the Hubble to make corrections and change some components. A second repair mission, STS-82, was made in February 1997, and a third, STS-103, in December 1999. For these repair missions, the astronauts practiced the work in MSFC's Neutral Buoyancy Facility, simulating the weightless environment of space. Through the 1990s, the Hubble did provide astronomy images that had never before been seen. During the next decade, two additional repair missions were made (March 2002 and in May 2009), eventually bringing the telescope to even better that its initially intended performance. Even before HEAO-2 (the Einstein Observatory) was launched in 1978, MSFC began preliminary studies for a larger X-ray telescope. To support this effort, in 1976 an X-Ray Test Facility, the only one of its size, was constructed at Marshall for verification testing and calibration of X-ray mirrors, telescope systems, and instruments. With the success of HEAO-2, MSFC was given responsibility for the design, development, and construction of what was then known as the Advanced X-ray Astrophysics Facility (AXAF). The Smithsonian Astrophysical Observatory (SAO) partners with MSFC, providing the science and operational management. Work on the AXAF continued through the 1980s. A major review was held in 1992, resulting in many changes; four of the twelve planned mirrors were eliminated, as were two of the six scientific instruments. The planned circular orbit was changed to an elliptical one, reaching one-third of the way to the Moon at its farthest point; this eliminated the possibility of improvement or repair using the Space Shuttle, but it placed the spacecraft above the Earth's radiation belts for most of its orbit. AXAF was renamed Chandra X-ray Observatory in 1998. It was launched July 23, 1999, by the Shuttle Columbia (STS-93). An Inertial Upper Stage booster adapted by MSFC was used to transport Chandra to its high orbit Weighing about 22,700 kg (50,000 lb), this was the heaviest payload ever launched by a Shuttle. Operationally managed by the SAO, ‘’Chandra’’ has been returning excellent data since being activated. It initially had an expected life of five years, but this has now been extended to 15 years or longer. The Compton Gamma Ray Observatory (CGRO) is another of NASA's Great Observatories; it was launched April 5, 1991, on Shuttle flight STS-37. At 37,000 pounds (17,000 kg), it was the heaviest astrophysical payload ever flown at that time. CGRO was 14 years in development by NASA; TRW was the builder. Gamma radiation (rays) is the highest energy-level of electromagnetic radiation, having energies above 100 keV and thus frequencies above 10 exahertz (1019 Hz). This is produced by sub-atomic particle interactions, including those in certain astrophysical processes. The continuous flow of cosmic rays bombarding space objects, such as the Moon, generate this radiation Gamma rays also result in bursts from nuclear reactions. The CGRO was designed to image continuous radiation and to detect bursts. MSFC was responsible for the Burst and Transient Source Experiment, (BATSE). This triggered on sudden changes in gamma count-rates lasting 0.1 to 100 s; it was also capable of detecting less impulsive sources by measuring their modulation using the Earth occultation technique. In nine years of operation, BATSE triggered about 8000 events, of which some 2700 were strong bursts that were analyzed to have come from distant galaxies. Unlike the Hubble Space Telescope, the CGRO was not designed for on-orbit repair and refurbishment. Thus, after one of its gyroscopes failed, NASA decided that a controlled crash was preferable to letting the craft come down on its own at random. On June 4, 2000, it was intentionally de-orbited, with the debris that did not burn up falling harmlessly into the Pacific Ocean. At MSFC, Gerald J. Fishman is the principal investigator of a project to continue examination of data from BATSE and other gamma-ray projects. The 2011 Shaw Prize was shared by Fishman and Italian Enrico Costa for their gamma-ray research. Shortly before activating its new Field Center in July 1960, NASA described the MSFC as the only self-contained organization in the nation that was capable of conducting the development of a space vehicle from the conception of the idea, through production of hardware, testing, and launching operations. Initially, engineers from Huntsville traveled to Florida to conduct launch activities at the Cape Canaveral Air Force Station. The first NASA launch facility there (Launch Complex 39) was designed and operated by MSFC, then on July 1, 1962, the overall site achieving equal status with other NASA centers and was named the Launch Operations Center, later renamed the Kennedy Space Center (KSC). Another major NASA facility, the Manned Spacecraft Center (MSC) located near Houston, Texas, was officially opened in September 1963. Designated the primary center for U.S. space missions and systems involving astronauts, it coordinates and monitors crewed missions through the Mission Control Center. MSC was renamed the Lyndon B. Johnson Space Center (JSC) in February 1973. Through the years, there have been a number of ‘turf’ battles between MSFC and MSC/JSC concerning mission responsibilities. With the exception of Koelle, all of the technical leaders had come to the United States under Operation Paperclip after working together at Peenemünde. Von Braun knew well the capabilities of these individuals and had great confidence in them. This confidence was shown to be appropriate; in the following decade of developing hardware and technical operations that established new levels of complexity, there was never a single failure of their designs during manned flight. The initial projects at MSFC were primarily continuations of work initiated earlier at ABMA. Of immediate importance was the final preparation of a Redstone rocket that, under Project Mercury would lift a space capsule carrying the first American into space. Originally scheduled to take place in October 1960, this was postponed several time and on May 5, 1961, astronaut Alan Shepard made America's first sub-orbital spaceflight. The delays led to a circumstance similar to that of the first satellite; on April 12, 1961, Soviet cosmonaut Yuri Gagarin had become the first person to orbit the Earth. By 1965, MSFC had about 7,500 government employees. In addition, most of the prime contractors for launch vehicles and related major items (including North American Aviation, Chrysler, Boeing, Douglas Aircraft, Rocketdyne, and IBM) collectively had approximately a similar number of employees working in MSFC facilities. Several support contracting firms were also involved in the programs; the largest of these was Brown Engineering Company (BECO, later Teledyne Brown Engineering), the first high-technology firm in Huntsville and by this time having some 3,500 employees. In the Saturn-Apollo activities, BECO/TBE provided about 20-million man-hours of support. Milton K. Cummings was the BECO president, Joseph C. Moquin the executive vice president, William A. Girdini led the engineering design and test work, and Raymond C. Watson, Jr., directed the research and advanced systems activities. Cummings Research Park, the second largest park of this type in the Nation, was named for Cummings in 1973. On May 25, 1961, just 20 days after Shepard's flight, President John F. Kennedy committed the Nation to "achieving the goal, before this decade is out, of landing a man on the Moon and returning him safely to Earth". In what would be called the Apollo Program, the primary mission of MSFC was developing the heavy-lift rockets – the Saturn family. This required the development and equalization of three new liquid-fueled rocket engines, the J-2, the F-1, and the H-1 (rocket engine); in addition, an existing engine, the RL10, was improved for use on Saturns. Leland F. Belew managed the Engine Development Office. The F-1 engine was, and still is the most powerful single-nozzle liquid-fueled rocket engine ever used in service; each produced 1.5-million-pounds thrust. Originally started by the U.S. Air Force, responsibility for the development was taken over by ABMA in 1959, and the first test firings at MSFC were in December 1963. The original vehicle, designated Saturn I, consisted of two propulsion stages and an instrument unit; it was first tested in flight on October 27, 1961. The first stage (S-I) had a cluster of eight H-1 engines, giving approximately 1.5-million-pounds thrust total. The four outboard engines were gimbaled to allow vehicle steering. The second stage (SIV) had six gimbaled LR10A-3 engines, producing a combined 90-thousand-pounds thrust. Ten Saturn Is were used in flight-testing of Apollo boilerplate units. Five of the test flights also carried important auxiliary scientific experiments. The Saturn IB (alternatively known as the Uprated Saturn I) also had two propulsion stages and an instrument unit. The first stage (S-IB) also had eight H-1 engines with four gimballed, but the stage had eight fixed fins of equal size fitted to the sides to provide aerodynamic stability. The second stage (S-IVB) had a single J-2 engine that gave a more powerful 230-thousand-pounds thrust. The J-2 was gimbaled and could also be restarted during flight. The vehicle was first flight-tested on February 26, 1966. Fourteen Saturn 1Bs (or partial vehicles) were built, with five used in unmanned testing and five others used in manned missions, the last on July 15, 1975. The Saturn V was the pinnacle of developments at MSFC. This was an expendable, man-rated heavy-lift vehicle that was the most vital element in the Apollo Program. Designed under the direction of Arthur Rudolph, the Saturn V holds the record as the largest and most powerful launch vehicle ever brought to operational status from a combined height, weight, and payload standpoint. The Saturn V consisted of three propulsion stages and an instrument unit. The first stage (S-IC), had five F-1 engines, giving a combined total of 7.5-million-pounds thrust. These engines were arranged in a cross pattern, with the center engine fixed and the outer four gimballed. The second stage (S-II), had five J-2 engines with the same arrangement as the F-1s and giving a total of 1.0-million-pounds thrust. The third stage (S-IVB) had a single gimballed J-2 engine with 200-thousand-pounds thrust. As previously noted, the J-2 engine could be restarted in flight. The basic configuration for this heavy-lift vehicle was selected in early 1963, and the name Saturn V was applied at that time (configurations that might have led to Saturn II, III, and IV were discarded). The Apollo Spacecraft was atop the launch vehicle, and was composed of the Lunar Module (LM) and the Command/Service Module (CSM) inside the Spacecraft Lunar Module Adapter, with the Launch Escape System at the very top. The Apollo Spacecraft and its components were developed by other NASA centers, but were flight-tested on Saturn I and IB vehicles from MSFC. While the three propulsion stages were the "muscle" of the Saturn V, the Instrument Unit (IU) was the "brains." The IU was on a 260-inch (6.6-m) diameter, 36-inch (91-cm) high, ring that was held between the third propulsion stage and the LM. It contained the basic guidance system components – a stable platform, accelerometers, a digital computer, and control electronics – as well as radar, telemetry, and other units. Basically the same IU configuration was used on the Saturn I and IB. With IBM as the prime contractor, the IU was the only full Saturn component manufactured in Huntsville. The first Saturn V test flight was made on November 9, 1967. On July 16, 1969, as its crowning achievement in the Apollo space program, a Saturn V vehicle lifted the Apollo 11 spacecraft and three astronauts on their journey to the Moon. Other Apollo launches continued through December 6, 1972. The last Saturn V flight was on May 14, 1973, in the Skylab Program (described later). A total of 15 Saturn Vs were built; 13 functioned flawlessly, and the other two (intended as backup) remain unused. Wernher von Braun believed that the personnel designing the space vehicles should have direct, hands-on participation in the building and testing of the hardware. For this, MSFC had facilities comparable with the best to be found in private industries. Included were precision machine shops, giant metal-forming and welding machines, and all types of inspection equipment. For every type of Saturn vehicle, one or more prototypes were fabricated in MSFC shops. Large, special-purpose computers were used in the checkout procedures. Static test towers had been constructed at ABMA for the Redstone and Jupiter rockets. In 1961, the Jupiter stand was modified to test Saturn 1 and 1B stages. A number of other test stands followed, the largest being the Saturn V Dynamic Test Stand completed in 1964. At 475 feet (145 m) in height, the entire Saturn V could be accommodated. Also completed in 1964, the S1C Static Test Stand was for live firing of the five F-1 engines of the first stage. Delivering a total of 7.5-million-pounds thrust, the tests produced earthquake-like rumbles throughout the Huntsville area and could be heard as far as 100 miles (160 km) away. As the Saturn activities progressed, external facilities and factories were needed. In 1961, The Michoud Rocket Factory near New Orleans, Louisiana, was selected as the Saturn V rocket manufacturing site. A 13,500 acres (55 km2) isolated area in Hancock County, Mississippi was selected to conduct Saturn tests. Known as the Mississippi Test Facility (later renamed the John C. Stennis Space Center), this was primarily to test the vehicles built at the rocket factory. On January 5, 1972, President Richard M. Nixon announced plans to develop the Space Shuttle, a reusable Space Transportation System (STS) for routine access to space. The Shuttle was composed of the Orbiter Vehicle (OV) containing the crew and payload, two Solid Rocket Boosters (SRBs), and the External Tank (ET) that carried liquid fuel for the OV's main engines. MSFC was responsible for the SRBs, the OV's three main engines, and the ET. The Center also received responsibility for Spacelab, a versatile laboratory that would be carried on some flights within the Shuttle's cargo bay. Other assignments included the adaptation of the Inertial Upper Stage Booster, a two-stage rocket that would lift Shuttle payloads into higher orbits or interplanetary voyages. The first test firing of an OV main engine was in 1975. Two years later, the first firing of a SRB took place and tests on the ET began at MSFC. The first Enterprise OV flight, attached to a Shuttle Carrier Aircraft (SCA – an extensively modified Boeing 747), was in February 1977; this as followed by a free landings in August and October. In March 1978, the Enterprise OV was flown atop a SCA to MSFC. Mated to an ET, the partial Space Shuttle was hoisted onto the modified Saturn V Dynamic Test Stand where it was subjected to a full range of vibrations comparable to those in a launch. The second Space Shuttle, Columbia, was completed and placed at the KSC for checking and launch preparation. On April 12, 1981, the Columbia made the first orbital test flight. From the start, MSFC has had strong research projects in science and engineering. Two of the early activities, Highwater and Pegasus, were performed on a non-interference basis while testing the Saturn I vehicle. In Project Highwater, the dummy second stage was filled with 23,000 US gallons (87 m3) of water as ballast, and, after burnout of the first stage, explosive charges released the water into the upper atmosphere. The project answered questions about the diffusion of liquid propellants in the event that a rocket was destroyed at high altitude. Highwater experiments were carried out in April and November,1962. Under the Pegasus Satellite Program, the second stage was instrumented to study the frequency and penetration depth of micrometeoroids. Two large panels were folded into the empty stage and, when in orbit, unfolded to present 2,300-square-feet (210-m2) of instrumented surface. Three Pegasus satellites were launched during 1965, and stayed in orbit from 3 to 13 years. The overall Apollo Program was the largest scientific and engineering research activity in history. The actual landing on the Moon led to investigations that could have only been conducted on location. There were six Apollo missions that landed on the Moon: Apollo 11, 12, 14, 15, 16, and 17. Apollo 13 had been intended as a landing, but only circled the Moon and returned to Earth after an oxygen tank ruptured and crippled power in the CSM. Except for Apollo 11, all of the missions carried an Apollo Lunar Surface Experiments Package (ALSEP), composed of equipment for seven scientific experiments plus a central control station (they were controlled from the Earth) with a radioisotope thermoelectric generator (RTG). Scientists from MSFC were among the co-investigators. The Lunar Roving Vehicle (LRV), popularly known as the "Moon Buggy," was developed by MSFC to provide transportation for exploring a limited amount of the Moon's surface. Not intended in the original planning, by 1969 it became clear that an LRV would be needed to maximize the scientific returns. An LRV was carried on the last three missions, allowing an area similar in size of Manhattan Island to be explored. Outbound they carried an ALSEP to be set up; on the return trip, they carried more than 200 pounds of lunar rock and soil samples. Saverio E. "Sonny" Morea was the LRV project manager at MSFC. MSFC engineers tested this articulated arm developed, but not used, for Skylab at a MSFC flat floor facility. Even before the first Apollo landing, plans were being made by NASA for an Apollo Applications Program (AAP). This involved science-based manned space missions using surplus Apollo equipment. The lack of interest by Congress, and subsequent lack of funding, cut out most of the proposed activities – such as Manned Venus Flyby – but an orbital workshop remained of interest. Under Project Horizon in the late 1950s, use of spent missile stages for building a manned orbital space station had been proposed, and this general concept was picked up under AAP. In December 1965, MSFC was authorized to have the Orbital Workshop as a formal project. At a meeting at MSFC on August 19, 1966, George E. Mueller, NASA Associate Administrator for Manned Space Flight, pinned down the final concept for the major elements. MSFC was assigned responsibility for the development of the orbiting space station hardware as well as overall systems engineering and integration. Meanwhile, the U.S. Air Force was pursuing the Manned Orbiting Laboratory (MOL), a small space station with a two-man crew, primarily intended for photo reconnaissance. For five years, MOL competed with a NASA station for funding but was finally dropped. MSFC used the Neutral Buoyancy Facility to test Skylab procedures. Here, engineers are testing procedures for repairing Skylab. For testing and mission simulation, a 75-foot (23 m)-diameter water-filled tank, the Neutral Buoyancy Facility, was opened at MSFC in March 1968. Engineers and astronauts used this underwater facility to simulate the weightlessness (or zero-g) environment of space. This was particularly used in training astronauts in activities in zero-g work, especially spacewalks. The Orbital Workshop was designed using the hull of a Saturn V third stage, being fully refitted on the ground. It was renamed Skylab in February 1970. Two were built – one for flight and the other for testing and mission simulation in the Neutral Buoyancy Facility. Leland F Belew served for eight years as the overall Skylab program director. Another AAP project that survived was a solar observatory, originally intended to be a deployable attachment to the Apollo spacecraft. Called the Apollo Telescope Mount (ATM), the project was assigned to MSFC in 1966. As the Orbital Workshop matured into the Skylab, the ATM was added as an appendage, but the two activities were kept as independent development projects. Rein Ise was the ATM project manager at MSFC. The ATM included eight major instruments for observations of the Sun at wavelengths from extreme ultraviolet to infrared. The data was mainly collected on special photographic film; during the Skylab missions, the film had to be changed out by astronauts in spacewalks. On May 14, 1973, the 77-ton (70,000-kg) Skylab was launched into a 235-nautical-mile (435-km) orbit by a Saturn V vehicle (the last to be flown) with Skylab replacing the upper stage. Saturn IB vehicles with their CSMs were used to ferry three-man crews to where they docked with the Skylab. Severe damage was sustained during Skylab launch and deployment, resulting in the loss of the station's micrometeoroid shield/sun shade and one of its main solar panels. This loss was partially corrected by the first crew, launched May 25; they stayed in orbit with Skylab for 28 days. Two additional missions followed with the launch dates of July 28 and November 16, with mission durations of 59 and 84 days, respectively. Skylab, including the ATM, logged about 2,000 hours on some 300 scientific and medical experiments. The last Skylab crew returned to the Earth on February 8, 1974. The last Saturn IB flight was launched on July 15, 1975, carrying a three-man crew on a six-day mission to dock with a Soviet Soyuz spacecraft.. Called the Apollo–Soyuz Test Project (ASTP), the primary purpose was to provide engineering experience for future joint space flights, but both spacecraft also had scientific experiments. This was the last manned U.S. space mission until April 1981. The High Energy Astronomy Observatory (HEAO) Program involved three missions of large spacecraft in low-Earth orbit Each spacecraft was about 18 feet (5.5 m) in length, weighed between 6,000 and 7,000 lb (2,700 and 3,200 kg), and carried some 3,000 pounds (1,400 kg) of experiments for X-ray and gamma-ray astronomy and cosmic-ray investigations. The project provided revolutionary insights into celestial objects by studying their high-energy radiation from space. Scientists from across the Nation served as principal investigators. The HEAO spacecraft was conceived by MSFC in the late 1960s, but, with the Apollo Program, funding did not become available for some time. Using Atlas-Centaur launch vehicles, highly successful missions were started in August 1977 (HEAO 1), November 1978 (HEAO 2, also called the Einstein Observatory), and September 1979 (HEAO 3). Fred A. Speer was the HEAO project manager for MSFC. Other MSFC-managed space science projects in the 1970s included the Laser Geodynamics Satellite (LAGEOS) and Gravity Probe A. In LAGEOS, laser beams from 35 ground stations are reflected by 422 prismatic mirrors on the satellite to track movements in the Earth's crust. The measurement accuracy is a few centimeters and it tracks the movement of tectonic plates with comparable accuracy. Conceived and built at MSFC, the LAGEOS was launched by a Delta rocket in May 1976. Gravity Probe A, also called the Redshift Experiment, used an extremely precise hydrogen maser clock to confirm part of Einstein's general theory of relativity. The probe was launched in June 1976, by a Scout rocket, and remained in space for near two hours, as intended. ^ a b c "Marshall Space Flight Center Fact Sheet" (PDF). NASAfacts. NASA. November 3, 2016. Retrieved March 30, 2017. ^ Fidenbach, Peter L.; "A Brief History of White Sands Proving Ground" Archived 2014-10-28 at the Wayback Machine, N.M. State Univ. ^ Harbaugh, Jennifer (3 March 2015). "Marshall Missions". nasa.gov. Retrieved 22 March 2018. ^ Connolly, John F.; "Constellation Program Overview Archived 2007-07-10 at the Wayback Machine", NASA Constellation Program Office, October 2006; . ^ "Boeing: International Space Station" (PDF). www.boeing.com. Retrieved 22 March 2018. ^ "Boeing Transfers US Portions of International Space Station to NASA". Boeing. Boeing. 5 March 2010. Retrieved 18 August 2017. ^ "About Webb/NASA". www.jwst.nasa.gov. Retrieved 22 March 2018. ^ JSC, Jerry Wright :. "NASA - STS-125: The Final Visit". www.nasa.gov. Retrieved 22 March 2018. ^ "Chandra :: About Chandra :: The Extraordinary Universe with Chandra". chandra.harvard.edu. Retrieved 22 March 2018. ^ NASA - Fermi Telescope Caps First Year With Glimpse of Space-Time. Nasa.gov. Retrieved on 2013-07-21. ^ Space Shuttle Launch Archive. Science.ksc.nasa.gov (2003-02-01). Retrieved on 2013-07-21. ^ Opt.Cet. ; Wernher von Braun; "Crossing the Last Frontier,"
^ Morea, Saverio E; "The Lunar Roving Vehicle – Historical Perspective"
Wikimedia Commons has media related to Marshall Space Flight Center.